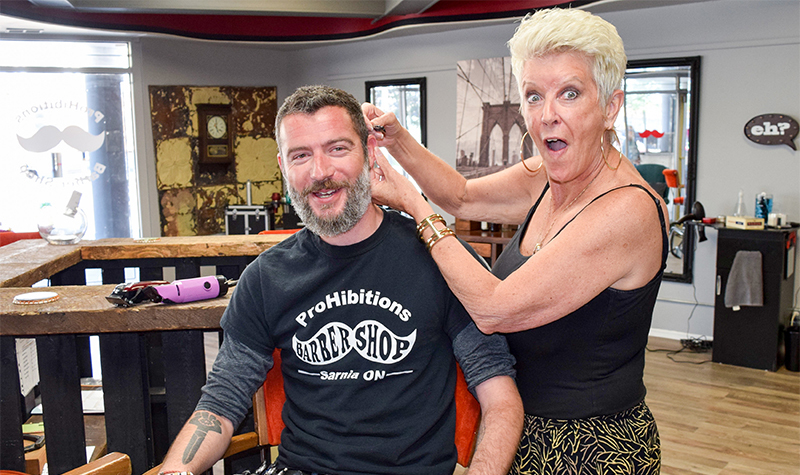 Business partners Bonnie Worsley and Sean Rae opened their own barbershop after deciding the big corporate life wasn’t for them. Both have worked for others, most recently at a haircutting franchise they say dictated everything from when to take breaks to what to say to clients. She grew up in Sarnia and returned last year after 35 years in British Columbia and Hawaii, where she owned a hair salon and hairstyling school. “I’ve met most of my best friends through hairdressing,” she said. “Hairdressers are hands-on, so you have to have a relationship with your clients. We want people to come on in, have a drink and relax. “That’s why we built the bar here,” she said, motioning toward the barbershop’s central counter surrounded by bar stools. Rae has 15 years’ experience working for other salon owners in Sarnia and Petrolia. He’s decided he prefers cutting men’s hair and providing men services like hot shaves. When he and Worsley met on the job last year they agreed they didn’t want to work in what they call “the fast food” of the hair cutting industry. Two months ago they opened ProHibitions Barbershop at 250 North Christina adjacent to the Kenwick building. Most of their clientele is men although they also offer services to women. The shop has two chairs and room for four other stylists who may want to rent space from them. The concept is to focus on old-time barbershop services at competitive prices. Hot shaves are $25. A shave and a cut is $40. Beard trims are $5 and up. Worsley says men, especially young men, are increasingly asking for bald fades, which start at $20. They involve a very close shave at the nape, then gradually increasing the length of the hair. “It’s all going back to that era in the mid ‘40s,” Worsley explained. “Men really like very short hair.” Beards are also making a big comeback. Women request “everything,” she added. But clipping hair underneath and allowing longer hair to fall overtop is a popular trend right now. Men and women’s haircuts at ProHibitions are $15 for the rest of August, then increasing to $20. A women’s colour is $50 to $60. ProHibitions also specializes in grooms’ parties, when the guys in a wedding party close the shop down to others and enjoy final haircuts, shaves and a “cleanup” just before the ceremony. ProHibitions is open six days a week. Thursdays and Fridays until 8 p.m. Appointments can be made on the shop’s Facebook page or by calling or texting Bonnie Worsley at 226-376-1815 and Sean Rae at 519-346-1804. Walk-ins welcome. Got an interesting business story? Contact Cathy Dobson at cathy.dobson@thesarniajournal.ca or call 226-932-0985.